It’s not a bad attempt. 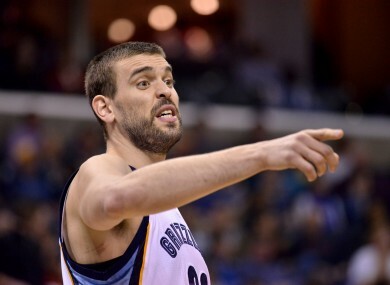 YOU MAY REMEMBER Marc Gasol from such vines as ‘Football in the Groin: Basketball Edition‘ but the Barcelona native briefly forgot which sport he was playing last night. The NBA’s 2012/13 Defensive Player of the Year and two-time All-Star is a big soccer fan and registered his frustration with being unable to convert an ‘and one’ layup after a foul by attempting to head the basketball into the net. Despite two attempts, Gasol can’t quite get the ball through the hoop. Good thing he’s paid to be a basketball player though as he finished with 16 points, 10 rebounds, four assists and this block on on Dwayne Dedmon as the Grizzlies beat the Orlando Magic 103-94. ‘Opponents’ celebrate touchdown and JJ Watt refuses to slack off — It’s the Pro Bowl! Email “A Spanish player tried to bring his soccer skills to the NBA last night”. Feedback on “A Spanish player tried to bring his soccer skills to the NBA last night”.